With the rapidly spreading awareness of non-renewable energy resources running out, people have constantly been looking for alternatives. These alternatives are called renewable energy resources. Not one, but many of these renewable energy resources exist. One of them is wind. However, of course wind can only be generated into energy in only windy and hilly areas. Hydroelectric energy and biomass energy are also forms of renewable energy resources. However the most common and most used inexhaustible renewable energy source is the sun. Sunlight is very commonly used in the form of electricity by converting sunlight into energy. This is done using solar panels. Solar panels once used to be very expensive. However with the rising demand of solar panels, the price has been gradually going down. It is now very affordable. Which is why in this day and age, many lighting types now exist which are given energy through solar panels. One of them is solar LED street lights. Solar panels are what are used to convert the absorbed sunlight into energy. They contain photovoltaic cells which help in converting sunlight into energy. Solar panels are usually mounted at the top of the Solar LED street lights so that they can directly get sunlight without any hindrances. These batteries are essential components of solar LED street lighting. The sunlight which is converted to energy is used to charge these batteries. Energy is even stored in these rechargeable batteries. This is done so that the solar LED street lights can light up during the night or for days when the sun doesn’t show. These are the lighting fixtures which are more commonly used as light sources for solar charged lighting systems. Light emitting diodes use half the amount of energy a traditional halogen or fluorescent bulb uses. Moreover, it is very long lasting. It can work for more than 10 years. LEDs also have in-built motion sensors in them. They light up when they detect someone moving. The solar panels on the solar LED street lighting absorb the sunlight and convert it into energy. This is done using the photovoltaic effect where the negatively charged electrons interact with the positively charged electrons. The sunlight is then transferred into these electrons, producing direct current electricity. Wiring is connected to the rechargeable battery and the direct current electricity is directed to the battery. During the night time, the battery then provides the energy to the light emitting diodes which light up. They provide light during the whole night and automatically turn off during the morning. Unless the sun doesn’t come up for days due to a storm, the energy stored in the battery can light up the LED lights for 3 -4 days. 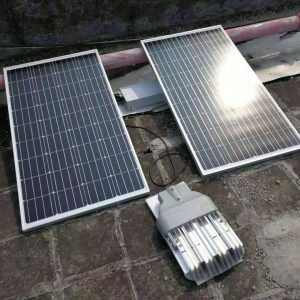 Since solar LED street lighting does not need to be connected to the electrical grid, they are super user-friendly to install. The first thing you will need to do is make some boundaries and take some safety precautions. You should always have some partners or a professional technician working with you if its your first time installing a solar street light. Moreover, familiarize yourself with the solar LED street lighting manual to help you connect the right wires in the right places. You will need to find flat ground with no bumps or rocks. Install the foundation of your solar street light there and make sure it anchors the pole. Secure the foundation with cement. You will then have to hoist the pole there with the help of your partners and technicians. You can even use a crane or car to do so. 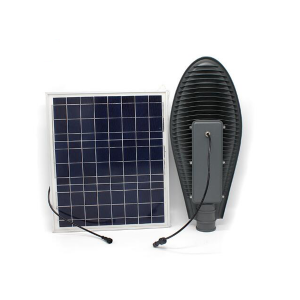 Make sure you install your LED lights and solar panels when the pole is on ground. It’ll be easier. Place your solar rechargeable battery. If you place it above ground, make sure it has some kind of protective casing around it. However, more preferably, you should place it underground to protect them from getting stolen or electrocuting someone. Connect the wires of the battery with the solar controller in the pole according to the manual. The solar controller should also be connected to the panel and LEDs. Shenzhen Juho has been up and running since 7 years. In all these 7 years, it has specialized in only making solar and LED related technology. Plus, its all very affordable! We keep track of the market demands and make technology keeping the market demands in mind. Which is why we are always making the most updated solar LED street lights. 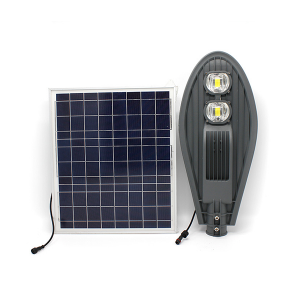 The quality of the solar LED street lighting systems which we provide is unmatchable. 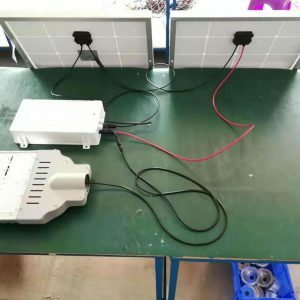 Efficient solar panels, upgraded lithium batteries with a high capacity, MPPT intelligent solar controller, motion sensors, automatically brightening LED chips. All of these components are used into making our solar LED street lights. Shenzhen Juho realizes that every customer has different needs and requirements. Which is why we offer to make customized solar LED street lights as well! Our experienced workers help in making the required lighting system a customer wants. Plus, We strictly follow a quality management control system: ISO9001:2008. Which means that we are completely trustworthy and reliable. We even use LED chips from different brands such as Bridgelux, Cree, Phillips and Epistar. Choose Shenzhen Juho for the best solar LED street lighting system. You will get more than satisfying.